PANCAKES Amsterdam is very proud to tell you that we serve VEGAN pancakes. PANCAKES Amsterdam offers vegan Dutch pancakes. Unfortunately, we do not serve vegan American pancakes and Poffertjes. Nevertheless, we have an amazing variety of vegan pancakes and the PANCAKES Amsterdam taste is still guaranteed. Veganism is a type of vegetarian diet. Veganism is a way of living that excludes the use of animals for food, clothing or any other purpose. For example, meat, eggs, dairy products and all other animal-derived ingredients. There are many ways to embrace vegan living and it’s becoming more popular every day. When you are visiting PANCAKES Amsterdam for some vegan pancakes, please ask our staff for our vegan menu. When ordering a vegan Dutch pancake, please make sure you tell our staff that. The preparation of a vegan pancake takes a little bit longer but this gives you more time to socialize with your family or friends. When your delicious vegan pancake arrives make sure there is a chip on your pancake like in the photo below. This chip is a clear sign and an easy way to recognize your special gluten-free, lactose-free or vegan pancake. And that our chefs have done their absolute best to prepare a vegan pancake. If you have any questions please ask our staff, they will be happy to answer them. Unfortunately our vegan pancakes are not gluten-free, we do have gluten-free and lactose-free pancakes but they are not VEGAN. We serve several gluten-free, lactose-free and vegan Dutch pancakes. Just ask our staff. ;) Or just take a look at our menu. Did you know we also sell our homemade pancakes mix and gluten-free pancake mix? 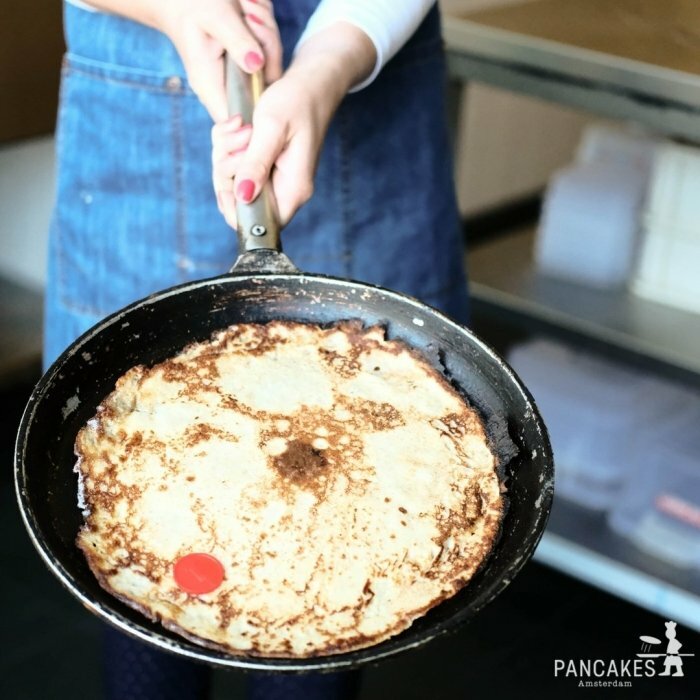 Our pancake mixes are especially made for and by PANCAKES Amsterdam. Wpould like to buy them? Click here to view the PANCAKES Amsterdam collection! PANCAKES Amsterdam offers vegan, gluten-free and lactose-free pancakes in all of our restaurants. So why don't you not come and visit us? If your question still has not been answered, please do not hesitate to contact us. You can always send us an email or contact us through Instagram or Facebook.